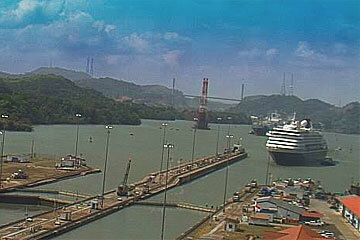 The MS Prinsendam Cruise Ship approaching the Miraflores Locks. The MS Prinsendam (formerly Seabourn Sun and Royal Viking Sun) is a cruise ship for Holland America Line and is nicknamed the Elegant Explorer. 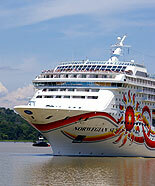 She was launched in 1988 as the Royal Viking Sun for the Royal Viking Line, and was renamed "Seabourn Sun" when Seabourn Cruise Line acquired the ship in 1999. Shortly after, in 2002, Seabourn wished to concentrate on more intimate vessels. 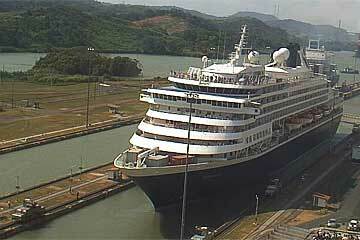 So, in 2002, they transferred the ship to Holland America Line, where it was renamed the Prinsendam. 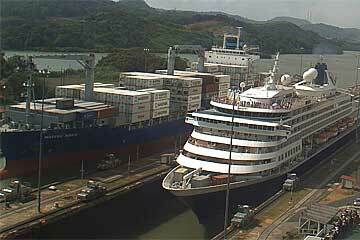 Here the MS Prinsendam is shown on her South Bound Panama Canal Transit on January 21 2010. A special signature sculpture dominates the three-story atrium featuring etched fish, turtles and dolphins climbing a stunning cylinder of Bolle glass and lit with state-of-the-art fiber optics. Dedicated: June, 2002, by Rose Abello, Eva Andresen and Linda Ehlenberger, representing all of the employees of Holland America Line.